Griswold grew up in Oberlin, Ohio and Rochester, New York. At 16, her family moved to Japan where she graduated from an international high school, then took a year off to study pottery and immerse herself in Japanese culture, while living with a Japanese family. She returned to the United States to attend college and studied classics and acting at Beloit College. 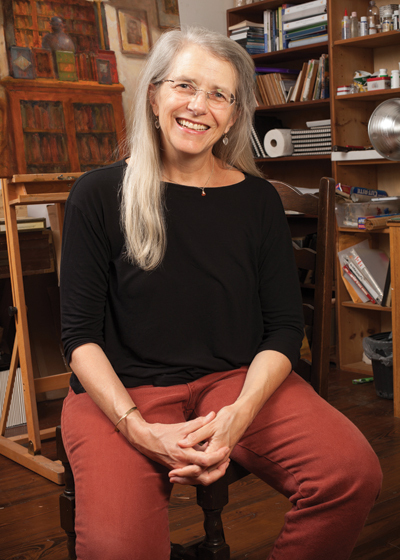 After becoming disillusioned with theater, she took a drawing course and has been painting in oils ever since. Influenced by the spare geometry of Japanese architecture and by the loose brush strokes and chiaroscuro of John Singer Sargent’s paintings, Griswold’s early pieces depicted street scenes with day or night-lit facades of buildings. Over the years, her subject matter has expanded to include still lifes, portraits, landscapes and interiors. The latter is marked by the kind of classic comfort that typifies English country houses (Griswold lived in England for a stint), by a keen ability to paint the soul of a place and by what the Japanese call “shibui,” which translates to quiet gentleness or understated elegance. Griswold and her husband, writer Roy Blount Jr., split their time between New Orleans and the Berkshires. She also offers painting workshops in both places. In 2016, her pieces were featured during the inaugural Southern Style Now design week at Catfish and Henry, author Julia Reed’s pop-up shop on Magazine Street in the former Dunn and Sonnier space. Griswold’s work is also frequently exhibited at Cole Pratt Gallery, which serves as local representation for the artist. View more of Griswold's work at joangriswold.com.